At last, my dress is stocked and available to buy online! And let me tell you, it felt like it was made for me. Almost knee length (which is what I always go for, short hems don't agree with my legs and my height) sporting a modest keyhole decolletage with attached bow tie, and in an amazing warm green colour. Not to mention, it should be perfect for those holiday family parties when you typically start the night wearing something corset-tight and you end up dreaming of your elasticized waist sweatpants mid-dinner. Well girls, this dress is fancy and HAS an elasticized waist! And it's silk chiffon, so I find that the €69 price is right. It's only been uploaded earlier today, so both sizes (SMALL and MEDIUM) should still available for now. And before you start complaining on why there's no LARGE size option, let me just tell you, I'm actually wearing the SMALL in that picture. Which I really shouldn't be able to do, but I do. So it goes without saying, it has some give. 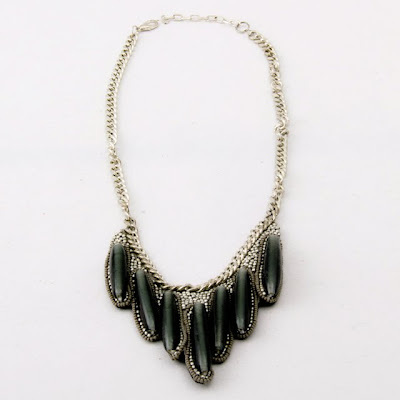 Next to the dress, under the COMPETE THE LOOK feature, is the statement necklace I styled it with. What was quite funny that at the photoshot was that all the girls were keep asking me if it's attached. It's not, but it goes perfectly good together with the dress, so it felt right to wear them that way. Even though the necklace gets partially covered by the bow tie, I still love the way it all turned out. Let me remind you that the Toi&moi e-FASHION STORE ships in Greece by courier for free, so if you're still struggling to find that perfect Christmas Eve dress and those damn transportation strikes in Athens are giving you a hard time, online shopping is a nice option to have in mind. P.S. The backstage pics post is coming right next! Woo hoo! You've hit the big leagues now, beautiful. The dress is GORGEOUS. Just like its namesake. Επιτέλους!Το φόρεμα είναι πραγματικά πολύ όμορφο,αλλά αυτό που μου έκλεψε την καρδιά είναι το κολιέ.Κάτι μου λέει ότι θα πετύχω κάποια που θα το έχει συνδυάσει όπως εσύ,γιατί αναδεικνύει το φόρεμα. it was about time me thinks! perfect timing just before christmas! You look very pretty!Hope you got it! I love the dress but I love the shoes more!Are they TOI&MOI too? wow way to go! that dress is gorgeous and you look stunning congrats!! I love it! It looks amazing with the shoes. But what the heck are you talking about when you say "your height"? Come on, get serious, lassie!! You're gorgeous! I didn't get it, but looking at this picture, I don't know if I'm prepared to let it go that easily! you bet they are! you can find them online too!